The central foundation in the coaching model I use is that the client is “naturally creative, resourceful, and whole”. My clients and I approach coaching as equals — allies, really — working together to get the client in touch with, and become habitual about acting from, the client’s own wisdom and courage and strength. Coaching doesn’t try to “fix” you or your problems, rather, it’s mindfully designed to help you discover and become your own solution(s). By empowering your sense of who you truly are and what really means the most to you, coaching offers you the most potent guidance you can get as a human — your own. Coaching affords you a powerful alliance, cooperatively designed, with the sole purpose of assisting you in achieving your life goals. Ever wish you had a friend who’d hear you out, empathize with you, tell you the truth, but then shut the heck up — instead of derailing the important conversations in your life toward themselves, giving you advice, or trying to cheer you up? Ever wish you had a personal growth assistant, a life-challenge cheerleader, an inspiration bank, or a goal accountant? Well, a coach is all of these things in one. During any particular session, Coaching looks like little more than an engaging conversation, but from the inside — big things are happening. I work mostly over the phone, but occasionally in person, and can also use Skype if preferred. The client brings an agenda for each time we meet, or a recurring one if there is an ongoing goal or issue being worked on; or comes with nothing other than an interest to explore. I ask lots of in-depth, get-you-thinking type questions; record and recall important points of discussion; articulate what I see, hear, or feel in the dynamic; assist the client in finding and holding a meaningful perspective on the subject(s) of discussion; explore the possibility of particular ways of being or acting in accordance with that perspective and the steps to take immediately; and then set up accountability measures for the client to lean on while getting started. We’ll just be talking, but if you live into what we’re talking about — Your whole life will change. It’s easy to get started. There’s no 1000-page manuals to read. There’s no commitment, other than to yourself. And there’s no costly hidden fees or convoluted packages to sift through. You don’t have to know every reason you’d want it, you don’t have to know every single detail about the goal(s) you want to work toward, you don’t even need to know everything about what you need to know! The CTI coaching model is designed to help even the most lost souls find themselves, their purpose, and their way. If you are willing to show up authentically, you can begin right where you are! I’ll even give you a complimentary strategy session so we can discuss your situation and how, as your coach, I might be able to help. We’ll spend 30 minutes chatting, I’ll even show you what coaching is like firsthand, if you wish. If we’re a good match and coaching with me would be of service to you — then we can get started in as little as a week. No matter what your goals are, or what changes you want to make in your life, or how far away your big dreams may feel — Coaching can help you make it happen. Get in touch with me now and we’ll be on your way! You may feel free to email me at nmmctague.cpcc@gmail.com or use my easy-breezy contact form! 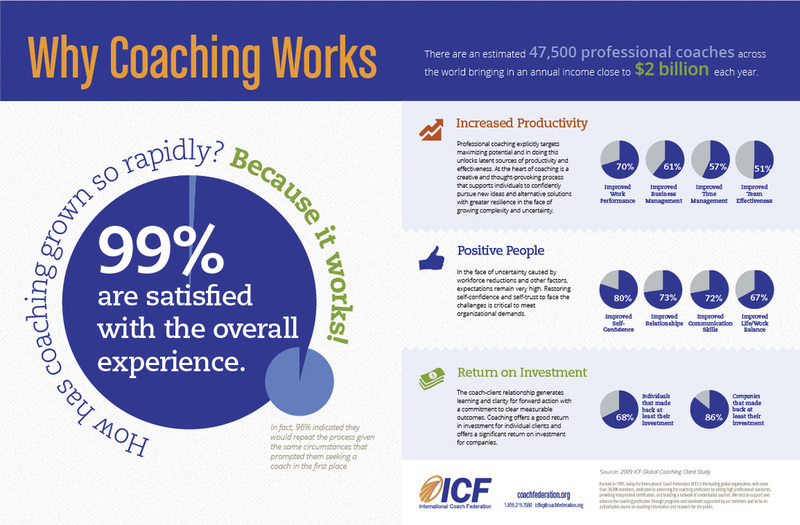 Below is a lovely info-graphic about the success of the coaching profession, particularly in the business sector. Were clients satisfied with their coach? Respondents were asked to rate their coach based on 13 criteria which were deemed extremely important to the coaching process. With 95% or more of respondents providing ratings of “good” or “excellent” for these criteria, coaches rated well in all areas tested. How satisfied are clients with their coaching experience? Virtually all (99%) of clients indicated that they were very or somewhat satisfied with the overall experience. Would clients choose to be coached again? Given the same circumstances that previously lead them to seek coaching, almost all (96%) clients indicated that they would indeed repeat the process. Primary Benefits (80% positive change or higher): This is a benefit that results from virtually all coaching regardless of type or primary objectives. Core Benefits (65% to 79% positive change): Like primary benefits, these areas may not be the primary objective of coaching; but a significant majority of clients will experience a benefit. General Benefits (50% to 64% positive change): These benefits are common to more than half of clients; but not a significant majority. While not always, these benefit are more likely to be specifically targeted by certain types of coaching. Niche Benefits (less than 50% positive change): Less than half of clients will experience these benefits. Generally, only coaching that specifically targets these areas will create a benefit. Does Coaching Work? A meta-analysis on the effects of coaching on individual level outcomes in an organizational context. At the ICF Research Portal, you’ll find a mountain of information on ROI. One of my favorite research articles is this one from the Journal of Positive Psychology, by Tim Theeboom, Bianca Beersma & Annelies E.M. van Vianena, Department of Work and Organizational Psychology, University of Amsterdam. Return on investment studies are often used to justify the business case for coaching interventions. Below is a summary of what’s really known about ROI. Return on investment or “ROI” is often considered a “bottom-line” concern when it comes to business coaching. Sometimes known as “coaching effectiveness,” ROI is often discussed as if it is the key metric to determine value, impact, or effectiveness of coaching. ROI typically measures the impact on the target group (clients) and the organization (stakeholders, colleagues, productivity, and other factors). It is often used as a way of measuring total benefits rather than just the benefit to the direct recipient of coaching (the client). Regardless of the importance placed on ROI, many researchers have noted how infrequently it is actually used in a business setting. Coaching experts believe this lack of attention to ROI stems from many factors including (1) difficulty of measuring more intangible outcomes; (2) reluctance to quantify an essentially qualitative interaction; (3) a strong reliance on verbally reported outcomes, based on the belief system of clients that a significant change has taken place and therefore additional metrics are not necessary; and (4) reluctance to accept ROI as a valid construct, and instead proposing alternative metrics such as a learning contract or a return on value (ROV) calculation. The typical formula for calculating ROI is based on (1) a calculation in dollars of the cost of a coaching intervention; (2) subtracted from a calculation in dollars of the benefits achieved; (3) with the resulting amount multiplied by 100; and (4) that total divided by the calculation of the cost of the coaching intervention. The resulting calculation is expressed as a percentage. Phillips, J.J., and Phillips, P.P. (2010). Measuring the success of coaching in organizations. Many websites mention coaching ROI as a way of promoting their own coaching services. The four listed in this section are more focused on providing illumination of the ROI concept and general information about ROI. 1. Performance Mastery. Compiled by Dan Johnson, this site includes brief summaries of the “classic studies” such as Manchester and Metrix Global LLC, as well as information about coaching and sales; coaching combined with training; and the value of coaching at work. 2. Graduate School of Master Coaches. This site provides a definition of ROI along with a few examples and case studies. 3. Facilitator. Simplifies many different formulas for ROI and translates them into useful tools and techniques for coaches, trainers, and peer and mentor program leaders. 4. Research Portal of The International Coach Federation (ICF). A compilation of articles from sources other than the ICF. Anderson, M.C. (2001). Executive briefing: Case study on the return on investment of executive coaching (Known as “The MetrixGlobal study”). (Retrieved November 6, 2010 from Wendy Hearn Coaching). This study was designed for a Fortune 500 firm and a coaching group to determine the business benefits and return on investment of coaching. Thirty of forty-three leadership development executives within the firm returned a two-part questionnaire (one part conducted by e-mail and the second part conducted via telephone). Overall results revealed that coaching had a significant to very significant benefit on nine business measures. Although specifics are not mentioned, the study author concludes that coaching produced a 529 percent return on investment and significant intangible benefits. When employee retention was included as a benefit overall ROI increased to 788 percent. McGovern, J., Lindemann, M., Vergara, M., Murphy, S., Barber, L., and Warrenfeltz, R. (2001). Maximizing the impact of executive coaching: Behavioral change, organizational outcomes, and return on investment. The Manchester Review, 6, 1, 1-9. (Known as “The Manchester Study”). This study revealed strong evidence of the effectiveness of executive coaching, demonstrated across all five levels of evaluation, beginning with participants’ reactions: 86 percent of participants and 74 percent of stakeholders were “very satisfied” or “extremely satisfied.” Seventy-three percent of participants considered that they had achieved their goals “very effectively” or “extremely effectively,” as did 54 percent of stakeholders. There were only 12 cases where participants reported not sustaining at least one of their developmental priorities. Relationships improved by 77 percent; teamwork improved by 67 percent; job satisfaction went up by 61 percent; productivity improved by 54 percent; and quality improved by 48 percent. Return on investment showed a value of $100,000 for the sample, or 5.7 times the initial estimate. Some estimates were as high as $1 million, $5 million, or even $25 million. The authors caution to select coaches with care, provide strong organizational support, and measure and communicate the impact to reproduce similar results in other organizations. With a Google search yielding more than 5.5 million hits on the term “coaching roi” it’s a daunting task to select the best articles or even to know which ones can be trusted. In addition, most coaches use the term ROI on their websites to promote their own coaching services or products. There is nothing inherently wrong with this type of marketing, and in many cases their explanations and examples of ROI can be instructive and educational. Here’s some articles (listed in alphabetical order by author) based on the following six criteria (1)the credibility of the author and source; (2) accessibility to the article; (3) the quality of the writing; (4) the emphasis on the detailing the concept of ROI and the de-emphasis on promoting self- interest; (5) the willingness of the author to identify potential problems or difficulties associated with ROI; and (6) the degree to which the author proposes innovative solutions or alternatives to ROI. Brief annotations with most of the articles listed provide more of a summary of what is included in the article. For those articles without annotation, the title was sufficient to explain the content. Battley, S. (u.d.). Coaching ROI: ‘Wow’ your clients with real results. Management Consulting News. (Retrieved November 6, 2010 from http://www.managementconsultingnews.co m/articles/battley_coaching_roi.php) Reinforces the importance of using ROI to make a business case for coaching and provides a few ideas on what elements in a coaching interaction for ROI. Benedict, S.L. (April/May, 2005). Wellness coaching: A life coach’s collaborative approach to integrative healthcare. Integrative Medicine: A Clinician’s Journal, 4, 2. Personal interviews with leading professional coaches and allied healthcare organizations led the author to conclude that a consensus has been reached showing coaching to be an ongoing relationship that focuses on clients taking forward action toward realizing their visions, goals, and desires. Interviews with wellness coaches and quantitative outcome studies clearly show increased return on investment (ROI) using coaching, as well as improved wellness. This return was especially present for weight loss and cardiac risk reduction. The author believes that the benefits of life/wellness coaching are being increasingly recognized throughout the US healthcare system, particularly within complementary and alternative medicine and integrative practices. Conventional practitioners are still uncertain about what coaching is and where it might fit within their profession. The author calls for more research and outcome studies to further validate the benefits of coaching to the healthcare system, and states that a more health- conscious and vocal public will lead to a wider use of coaching in the healthcare profession. Bolch, M. (May, 2001). Proactive coaching. Training, 38, 5, 58+. The author provides examples of how coaching has become welcomed in the world of business executives. Rather than being seen as a corrective measure for people in trouble, coaching is perceived as a way to develop potential, build a team atmosphere, re-start a stalled career, help people with blind spots, and inspire company loyalty. The author suggests that most coaches who are successful provide a personal touch, that in addition to email or phone contact includes face-to-face contact. While fees vary widely, hourly rates of $200(US) to $500(US) are common and most experienced coaches charge a day rate of $2500(US) to $3500(US). Two sidebars included with the article focus on how coaching provided a return on investment (ROI) and what to look for when searching for a top coach (integrity, fit and form, training, relevant experience, individual vs. group practice, references, measuring progress, and cost). The author also suggests that four factors contribute to a successful coaching engagement: a motivated client, organizational support, tracking progress, and maintaining dynamics. Chief Learning Officer. (April 3, 2006). 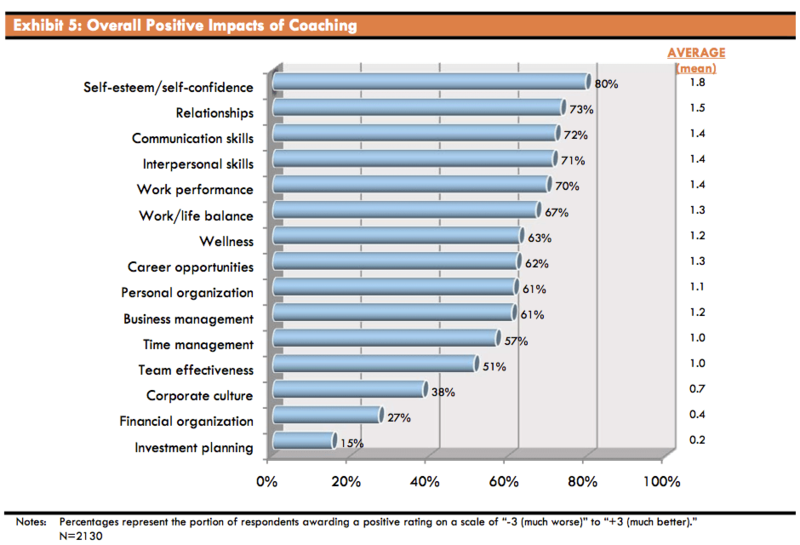 Survey: Coaching can have Financial impact in the millions. Chief Learning Officer. (Retrieved April 27, 2006 from http://www.clomedia.com/common/newscenter/ newsdisplay.cfm?id=5024). This article quotes a study by TRIAD, a Cleveland-based independent research group, that estimated that the impact of coaching can be in the million dollar range and that ROI was in the 10 to 1 range with long-term returns even higher. The TRIAD study showed that as a result of coaching there was less attrition of top performers, the creation of a positive work environment, increased salary levels, and reduction in erosion of customer-based revenue. The article also details five factors for finding a good coach: check a coach’s credentials; determine the relevance of a coach’s professional experience; find out if the coach is associated with a trusted organization; determine if the coach is willing to do an interview to see if there is a fit; and find out the degree to which the coach lets you as the client set the agenda. Hattiangadi, A.U. (April 10, 2000). Upgrading workplace skills: Businesses’ $300 billion annual investment. Contemporary Issues in Employment and Workplace Policy. Washington, DC: Employment Policy Foundation. Retrieved March 1, 2003 from http://www.epf.org). The private sector makes a substantial contribution to upgrading the skills of the US workforce. Using data on private sector GDP, direct training costs, and average annual hours spent in work and training, the Employment Policy Foundation estimates annual total training costs to firms of between $2,625 and $3,442 per worker–between $78,750 and $103,260 over a 30-year career. In aggregate terms, this means annual training expenditures by firms of $284.7 billion to $373.3 billion–more than the total annual spending of colleges and universities combined. This article lays a strong foundation for the use of mentoring and coaching as low cost interventions and can act as a basis for determining return on investment (ROI). Parrot, K. (2008). Executive coaching: A market research report. Cambridge, Massachusetts: Dialogos. This excellent report updates the report published in 2005 by Peer Resources (Coaching Statistics, facts, guesses, conventional wisdom, and the state of the industry). The report examines (1) coaching industry outlook and economics, including fee structures; (2) coaching outcomes and results, including impact studies and ROI; (3) organizations that support and educate coaches; and (4) how and for what services coaches are chosen by organizations. A chart included with the report provides details on 27 coaching service provides, comparing them on criteria such as size, coach experience and background; products and services offered; type of approach used; process used for contracting and engagement; and other details. Tobin, Daniel R. (1998). The fallacy of ROI calculations. [Online]. Dr. Tobin, one of the leading authorities on learning strategies in corporations points out the problems with calculations of ROI including whether ROI can ever really calculate powerful intangible factors, whether it actually includes the real reasons change occurred, and other problems. What makes this article unique is that Dr. Tobin has considerable experience in providing ROI calculations and formulas to corporations. In addition he specifies an alternative, which he calls the Learning Contract, that may have more power to detail change than ROI. Wilson, C. (March, 2004). Coaching and coach training in the workplace. Industrial and Commercial Training, 36, 3, 96-98. The author focuses on coaching and how the workplace is changing from authoritarian bosses and jobs for life towards self directed learning and portfolio careers. Outlines how the Virgin Empire was built using a coaching culture and provides case histories of the implementation of coaching and coach training in the workplace. Provides some facts and figures about Return On Investment (ROI), and why companies introduce coaching. Concludes with a look into the future. Click on the links below for more info on coaching. Again, you may feel free to get in touch with me to find out more about my coaching, and to set up your complimentary discovery session so you can tell me more about your situation and get a feel for my style of working via my email at nmmctague.cpcc@gmail.com or my contact page.